Photo of the day: ELECTION PROTECTION – VOTE! 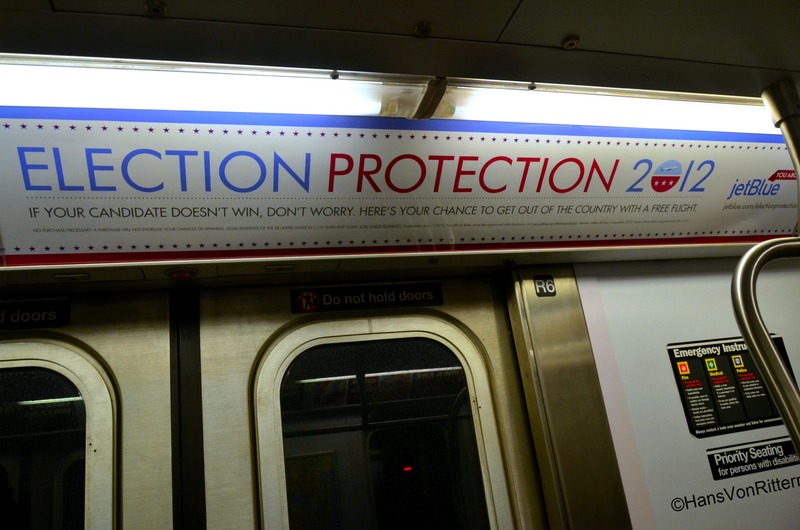 ELECTION CAMPAIGN: “Election Protection – If your candidate doesn’t win, don’t worry. Here’s your chance to get out of the country with a free flight.” Jet Blue’s clever New York subway campaign. With voter suppression disgustingly prevalent in so many states as if this was 100 years ago, all I can say is VOTE = VOTE = VOTE ! Democracy & freedom first! Most of you know which candidate I want to win, but if you will not be happy with the way things turn out in the next four years, the first and foremost question you should be asked is “did you vote?”. If your answer is ‘no’, you have no right to speak for the next four years, period. V O T E ! This entry was posted on November 6, 2012 by newyorkcityinthewitofaneye. It was filed under DAILY PHOTOS WITH STORIES OF NEW YORK CITY and was tagged with advertising, democrat, Hans Von Rittern, Jet Blue airlines, Manhattan, New York City, republican, subway, subway ad, VOTE.